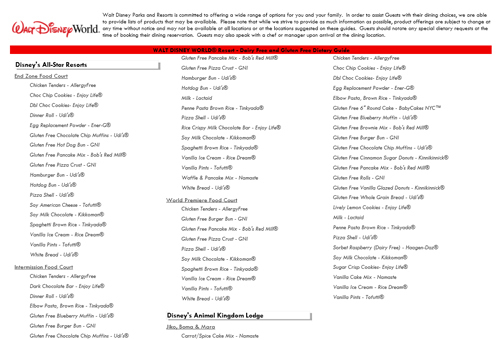 If you're planning a trip to Walt Disney World and you have diet restrictions due to allergies, I highly recommend you do this small bit of prep work before traveling. Email the helpful people at Disney's Special Diets Dept. 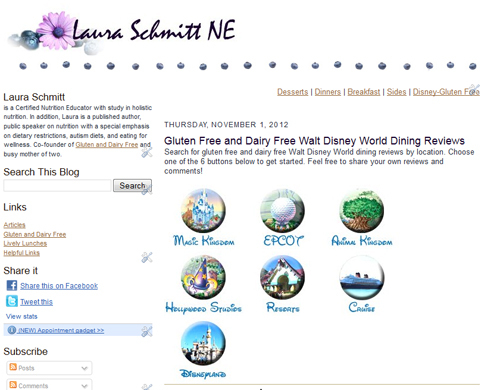 Special.Diets@DisneyWorld.com and let them know when you are coming and what allergies you have. Typically, they will send you a list like This One, that caters toward your dietary needs. With each trip, the listing of available gluten free dairy free options has changed, so it is important that you request the information each time you travel, rather than using old lists. Make reservations in advance! This is important, as many restaurants will fill up by the time your trip arrives. For those with food allergies, being able to sit down and wait for the chef to prepare a safe meal is well worth a short extra wait. The sooner you know your trip dates, the better. Start booking those meals! Browse through the many gluten free and dairy free meals, pictured here, to help you find some choices that fit your taste and needs.